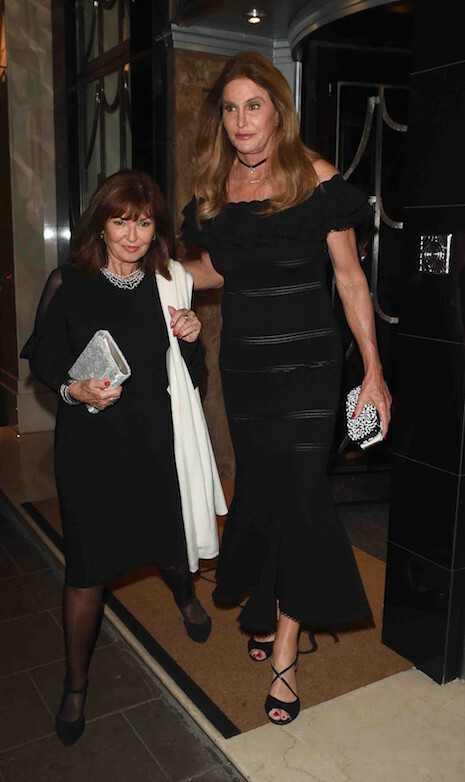 The good news is that Caitlyn Jenner was invited to a birthday party for one of the Sultan of Brunei’s sons at the posh Ambassador Casino in London. This causes one to ponder many questions such as “how did Caitlyn become friends with the Bruneis?” News to us. At first glance this photo looks like trick photography, but Caitlyn is, indeed, THAT much taller than her friend next to her. And the friend is wearing heels! She’s nicely dressed, but might be a good idea for Caitlyn to think about finding some taller friends so she looks daintier…. lol to make her look daintier, they’d have to be 20 feet tall! who needs him as a friend anyway? Isn’t the friend Stephanie Beacham of Dynasty fame? Come on, Janet. Brunei is a country. The sultan is Hassanal Bolkiah, therefore the son is a member of the Bolkiah family. Bruce can never look dainty. He probably knows these people because his daughters were rumored to be highly paid hookers over in those countries. Big pimping! More like the press needs to stop covering Jenner like he is doing something important. All of his outfits look silly. All of them. He needs a good stylist. Uh… I think he can afford that. She doesn’t need taller friends, she needs a total and thorough mental evaluation. Does he go to the Beverly Hills Country Club and like that? Is he still a member? I believe he would date a man. If he was still a man no way he’d get an invite.